Out with Rose Gold, in with Purple! Get Your Ears On- A Mickey and Minnie Celebration! Ready to Plan Your Disneyland Vacation? Disneyland will likely see large crowds this summer due to this addition so for some visiting this Spring and taking advantage of the deals offered by our travel partner are a good idea. Star Wars: Galaxy’s Edge will feature two brand new high tech attractions that will fully immerse you in the Star Wars universe: Millennium Falcon: Smugglers Run and Star Wars: Rise of the Resistance. Along with two new attractions, there will also be shops and a new dining experience called Oga’s Cantina- all meant to fully immerse you in the world of Star Wars. 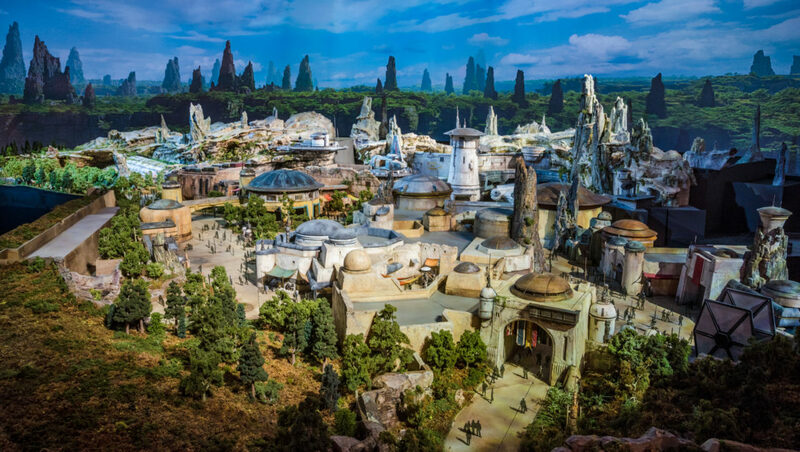 Walt Disney World will also see a new completely immersive Star Wars hotel added to the experience- no opening details have been released yet for that project. 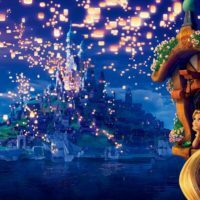 Potion Purple is the color of the year, according to Disney. I wonder who gets the job of picking which color is going to set the theme for the coming year? 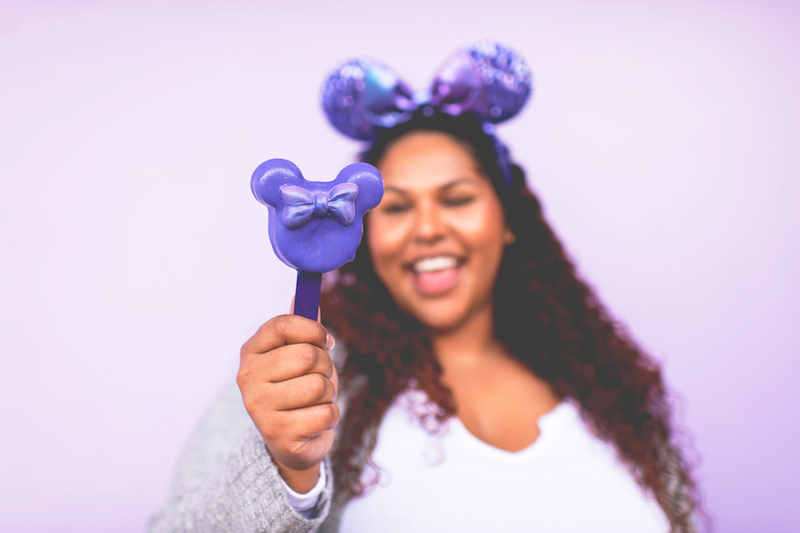 The new purple merchandise is available at both Disneyland, Walt Disney World, and online. You can find purple potion Minnie ears, spirit jerseys, Loungefly backpacks, and more. 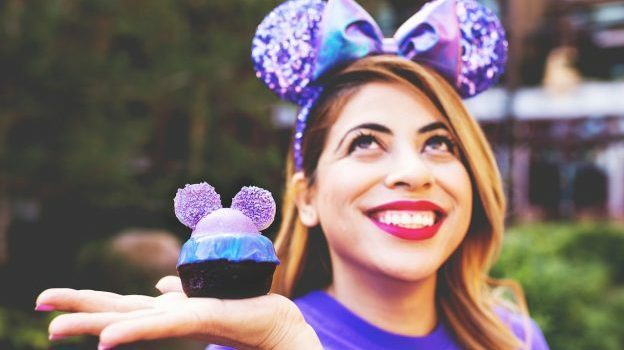 The purple potion doesn’t just stop at the merch- there will be plenty of purple themed treats to devour at both Disneyland with a few more options over at Walt Disney World. 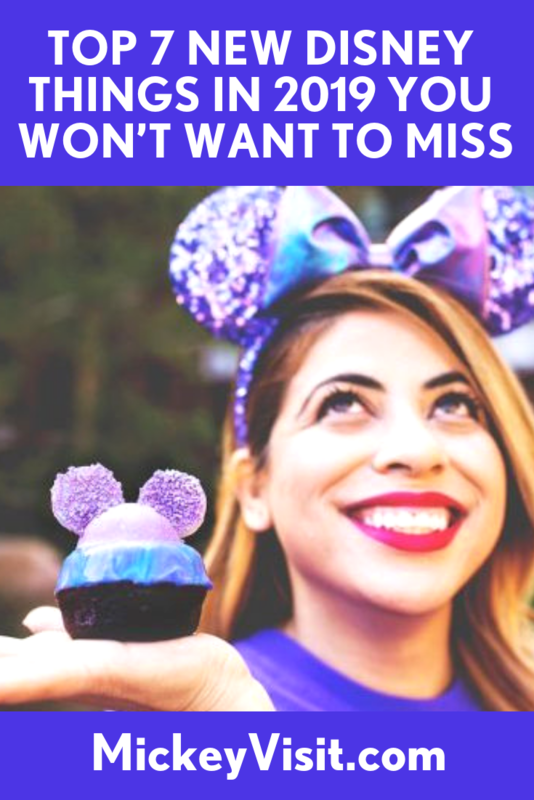 Disney has a foodie guide on all things purple that you can find here to start making your purchase plans. In honor of Mickey’s birthday, Disneyland is celebrating with “Get Your Ears On: A Mickey and Minnie Celebration” starting on January 18th. The celebration brings back the popular (with good reason!) Mickey’s Soundsational Parade- with the addition of a new opening to the fan favorite parade. February will also kick off a celebration of Mickey and Minnie Mouse’s love from January 22nd through February 18th with themed decor, special food and beverage offerings, and souvenirs. 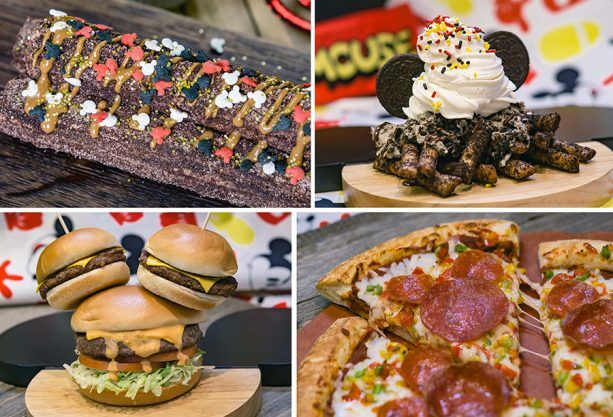 There will also be a wide variety of Mickey themed food and treats (check out that cheeseburger!) along with special Mickey merchandise to purchase. 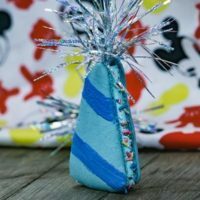 The biggest news about this celebration is the main event: Mickey’s Mix Magic. 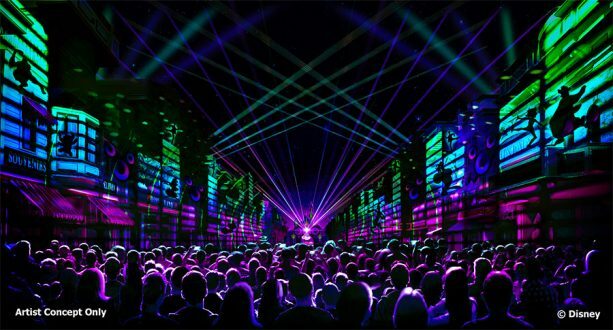 This projection show/dance party will display lasers, lights, and projections on Main Street, the Rivers of America waterscreens, and it’s a small world. The dance party will be led by DJ Mickey featuring mixes of favorite songs from Coco, Aladdin, Jungle Book, and more. Some nights will feature the addition of fireworks to this dance party display. 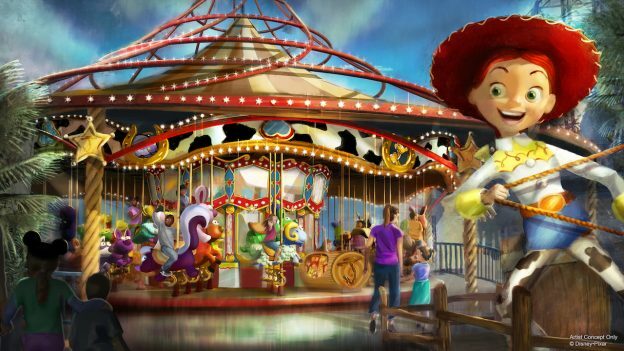 Pixar Pier at California Adventure will see the opening of the the re-themed attraction Jessie’s Critter Carousel this year. The carousel has been re-themed from an Ariel theme into a one more fitting of the Toy Story Neighborhood with Jessie as the forefront of this attraction. Guests can corral fun animals, such as an armadillo, bunny, buzzard, raccoon, skunk, turtle, rattelesnake, and deer. 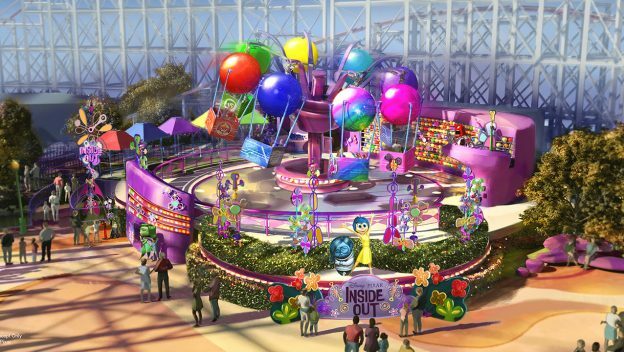 The old Flik’s Flyers from Bugs Land has been moved and redone into Inside Out Emotional Whirlwind to fit the theme the Inside Out Neighborhood. This attraction will feature the five emotions from the movies, Joy, Sadness, Anger, Fear, and Disgust. Both attractions are set to open in 2019! Parents of smaller children will be happy to see these additions as many worried the removal of Bugs Land was taking away from the experience of our smallest guests. 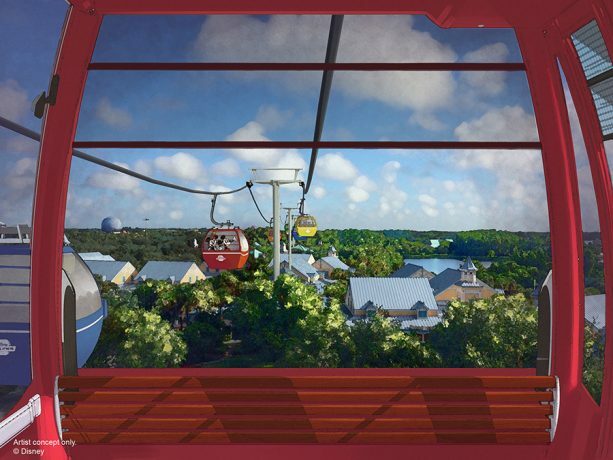 Beginning in Fall, Walt Disney World guests will have a new transportation option offering bird eye views of the resort. The new gondola system will connect Disney’s Hollywood Studios and Epcot to these resort hotels- Disney’s Art of Animation Resort, Disney’s Pop Century Resort and Disney’s Caribbean Beach Resort. Disney Parks has said this will be more than just a new transportation system but also a way for guests to experience views through the trees over the World Showcase in Epcot along with other picturesque scenery! Walt Disney World also has a new Lightning McQueen experience coming to Hollywood Studios along with the above mentioned addition of Star Wars: Galaxy’s Edge. You can see our calendar of events for Walt Disney World here to keep you posted of new additions. This list doesn’t include Fox Films planned for 2019 such as Dark Phoenix and New Mutants. Is anyone else having 90s flashbacks with that movie list? Plenty of nostalgic remakes to look forward to this year. 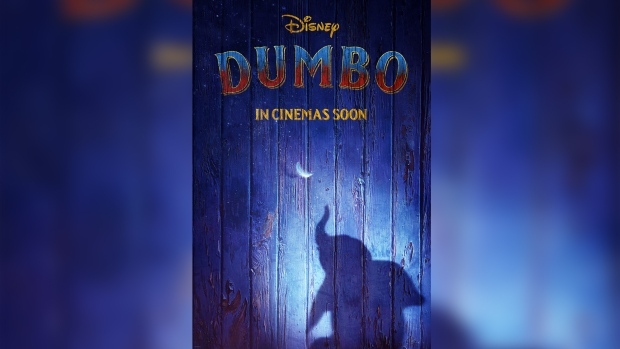 Although, I’m not sure I am strong enough to watch Dumbo! Coming this Fall, Frozen on Broadway is going on tour! You can check here to see if it’s coming to a city near you. While this is just the tip of the iceberg from an ever-evolving and dynamic company like Disney, these were the highlights I found to look forward to this 2019 year! 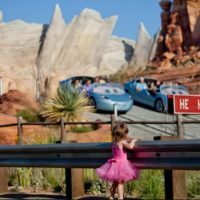 Next Post: Discount Disneyland Tickets 2019 – 12 Best Ways to Save on Disneyland Tickets!